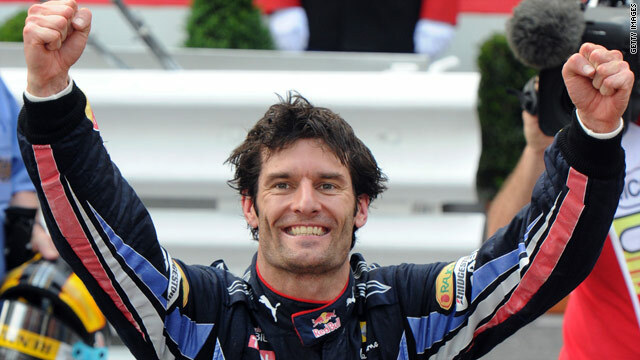 Australian Mark Webber celebrates his win at the Monaco Grand Prix. (CNN) -- Rampant Red Bull driver Mark Webber insists it is premature to talk about his chances of claiming the Formula One world title after he moved to the top of the drivers championship with victory in Monaco. The Australian won the Monaco Grand Prix from pole position, to add to his triumph at the Spanish Grand Prix in Barcelona the previous week. Webber was joined on 78 points by teammate Sebatian Vettel, who claimed victory in Malaysia, but is top due to his two wins. Red Bull are currently 22 points ahead in the constructors championship. But Webber says it is too early to talk about winning the world title given that there are 13 grand prix's still to be completed in the season. He told the official Formula One Web site: "It's nice to have a lot of points at the moment. But the season is still long and we will go to venues like Montreal or Budapest and other tracks where we have to go with eyes wide open to get a result. "But there is no need for the Italian people to panic yet: Ferrari are also very strong and everything is still wide open. There are not only two drivers who fight for the championship." Webber celebrated his win in Monaco by going for a dip in Red Bull's swimming pool and he says his triumph was one of the highlights of his F1 career. He added: "Two race wins within one week and bagging 50 points is already very special, but to win in Monaco is a quite unique thing in itself. "There is no driver that raced in Formula One that would not have liked to win here and it sure is the biggest highlight of my life in terms of race wins. "The last two races went very well for me, but I sure have to keep pushing and my motivation is very good. I've always taken every year as it comes and this year feels very right." The next stop on F1's European leg is the Turkish Grand Prix, starting on May 28.